Unified Technologies in Cleveland, Ohio has provided high quality shot blast equipment, washers, spare parts, technical support, service, and blast media since 1999. They provide a full range of shot blast and wash systems to handle the wide variety of customer applications. Art Koch, president of Unified Technologies was looking for the best conveyor product to recommend for his customer, Advanced Gas and Welding Solutions LLC. 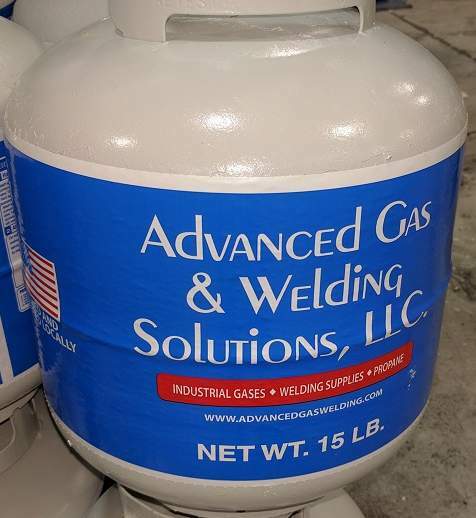 Advanced Gas and Welding Solutions needed to find a way to increase production by automating their process for painting gas propane bottles. Koch started with an on-line search and came across PACLINE’s video called Overhead Conveyor System Basics. This gave him a quick overview of PACLINE’s overhead conveyors and led him to another video that very specifically demonstrated the exact application his customer was looking for! – Wet Spray Finishing Conveyor System for Painting Propane Bottles. 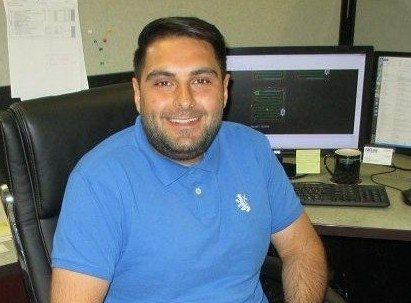 We asked Art to tell us about his first experience with PACLINE Overhead Conveyors. What were your customer’s requirements of the new conveyor system? Koch was unfamiliar with PACLINE and in fact had not ever sold a conveyor of this sort before. After reviewing the PACLINE website and a few product videos, Koch could see that the PAC-LINE™ overhead conveyor could do what his customer required. How did PACLINE assist you in determining the best conveyor solution for you / your customer? 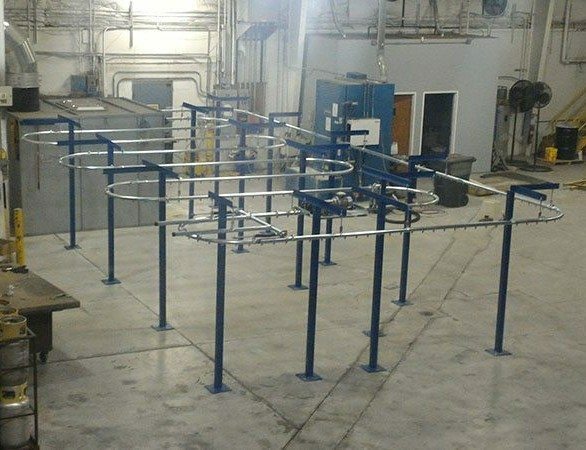 The final system for Advanced Gas and Welding was a single conveyor loop – 192 feet of PAC-LINE™ enclosed track overhead conveyor track and curves. The entire system was powered by a single drive unit. 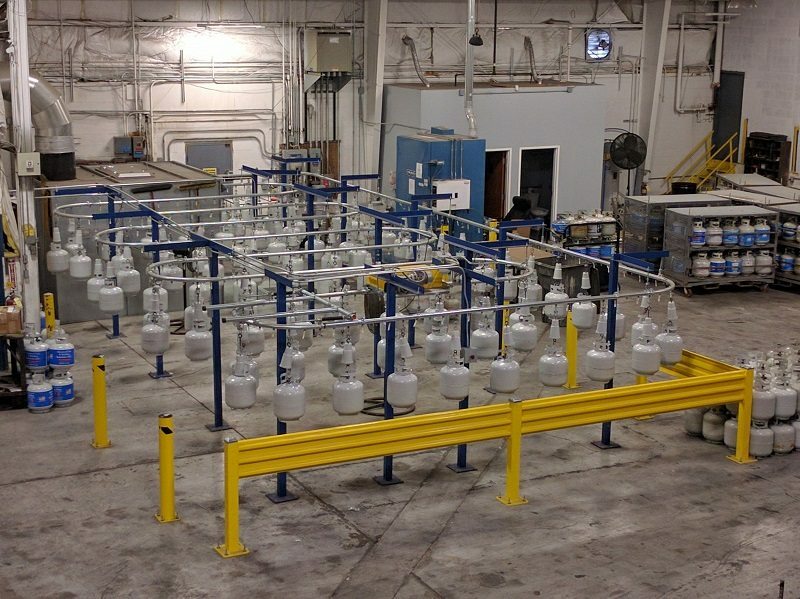 Standard rotators were used to hang the propane tanks and to rotate them automatically through the spray paint booth. The bolt-together design of the PAC-LINE™ conveyor track and curves saved significant costs on installation as there was no welding required. This feature also meant that the PAC-LINE™ system could be easily assembled and installed – even by integrators or end-users who may be unfamiliar with this type of conveyor. How did PACLINE support you after the system was purchased? What was the biggest challenge for you on this project? What was the final result of this installation? What did your customer have to say?